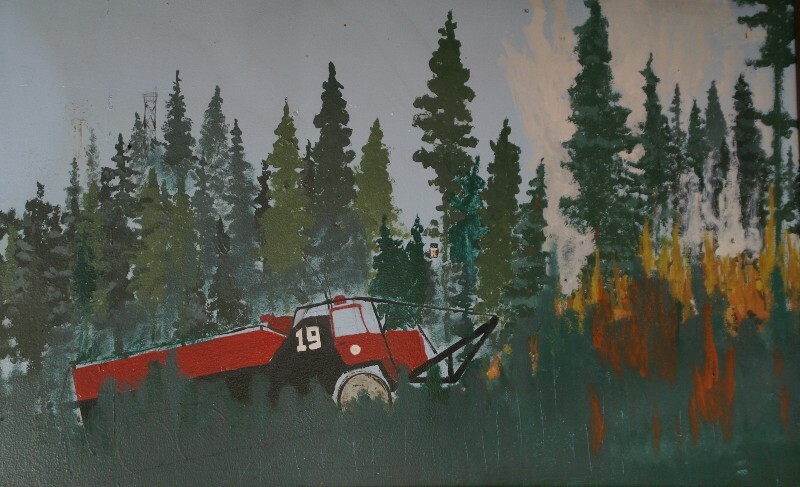 Before there were motorized vehicles, forest fires were able to burn almost unchecked. extinguishers but were slow and unable to go off main roads. Refilling hand held water extinguishers. 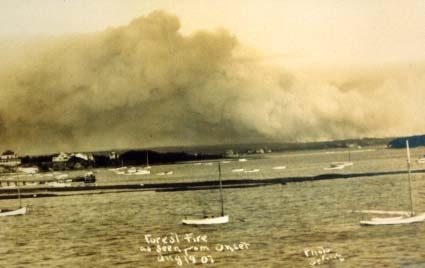 August 1907 photo from Onset bay of a Cape Cod forest fire. seedlings. This practice kept wide stretches of the forest clear of underbrush but did not damage the large standing trees. demise of the Sandwich Glass Company, one of the Cape's largest industrial businesses between 1825 and 1894. 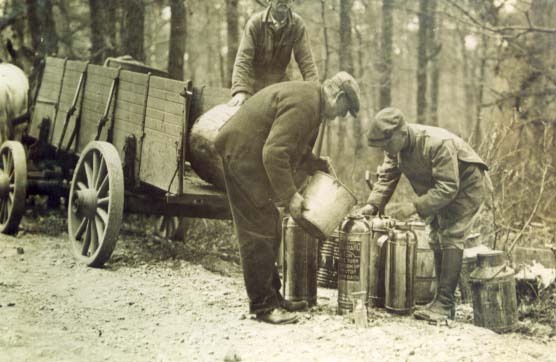 On May 30,1923 a fire began in the woods in Pocasset village. By the end of the day, it was thought that the fire was out. By morning however, it picked up again, burning through the day. 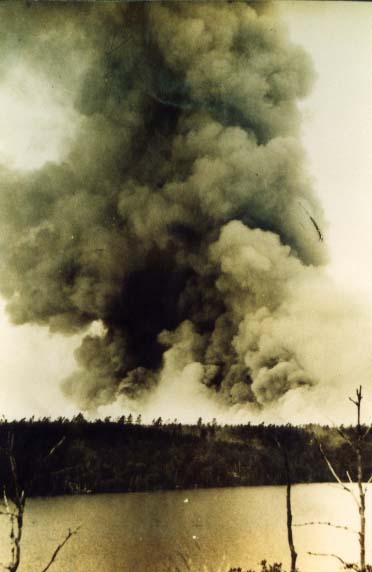 Once again, it was believed that it was under control by nightfall, only to flare up again and again for 7 days. 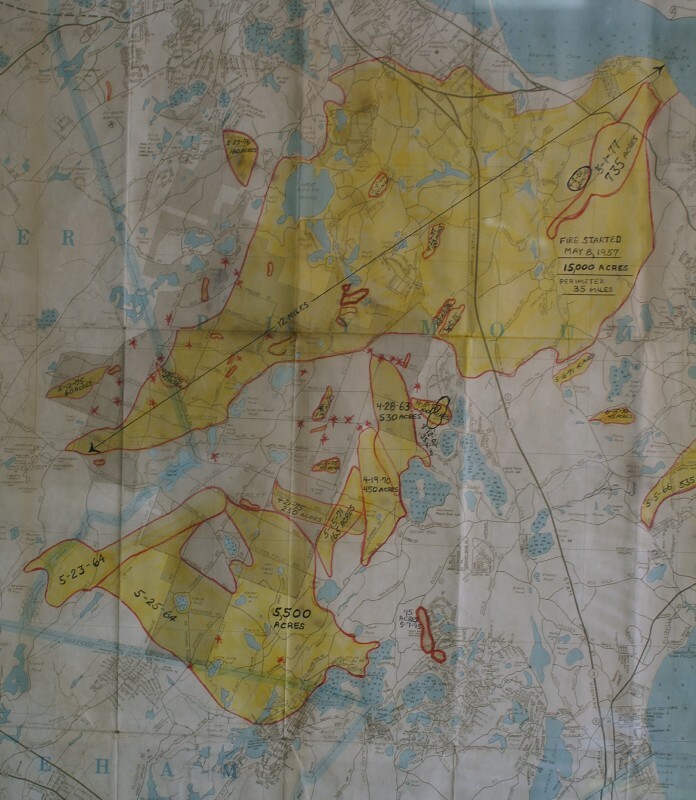 An area of approximately 25,000 acres, between Pocasset village, Sagamore, Sandwich, East Sandwich, and South Sandwich was left blackened. The State Commissioner of Conservation stated that "something was radically wrong" adding that the fire could have been contained to about 1,000 acres if it had been properly handled since it was not even a "fire day." 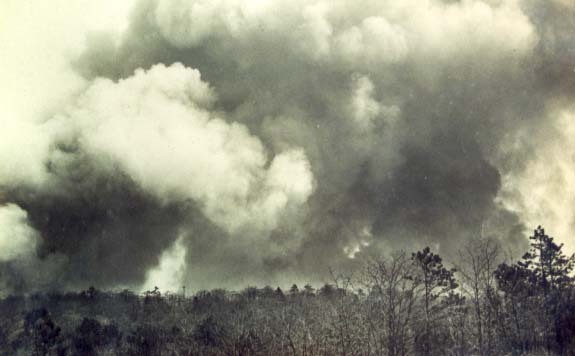 Following this fire, the state purchased hundreds of acres of burned over forest in Bourne and Sandwich and created the Shawme State Forest in 1923. The name was changed in 1938 to the Shawme-Crowell State Forest, honoring Lincoln Crowell for his long dedication to the Cape's forests. Crowell was killed in 1938 when the patrol truck he was in was struck by a train in Brewster. Southern Forests Education campaign... The Cape Cod program involved 110,000 acres of scrub oak and pitch pine. 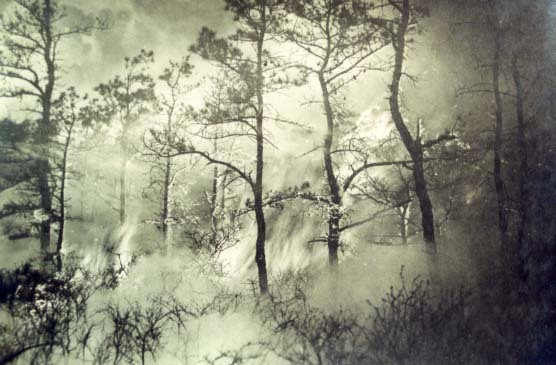 The experiment was intended to compare the costs of prevention and pre-suppression with those of suppression...." This statement in "Fire in America" by Stephen J. Pyne c.1982, demonstrates how serious the forest fire situation on the Cape was at that time. 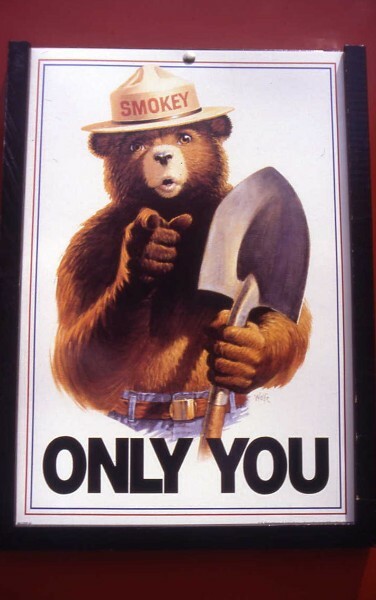 The Smokey the Bear program grew out of these early fire prevention efforts. Forest fires can be extremely dangerous, especially when fought by hand. 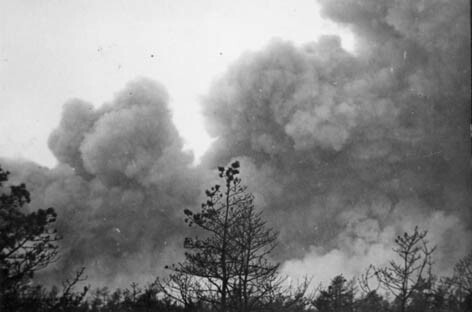 One of the worst fires ever on Cape Cod struck on April 27, 1938. A number of fires were burning on the Cape and in Plymouth County, when another fire began in Sandwich Bourne Deputy Chief Gibbs took a crew of young men, volunteers, with him in to fight the fire west of what is now Route 130 in Sandwich. 40 mile per hour winds fanned the flames and the men were soon trapped by the fire. All received serious burns. Three men, Thomas Adams, age 43; Gordon King, age 34, and Ervin Draber, age 28 died that day fighting this forest fire. 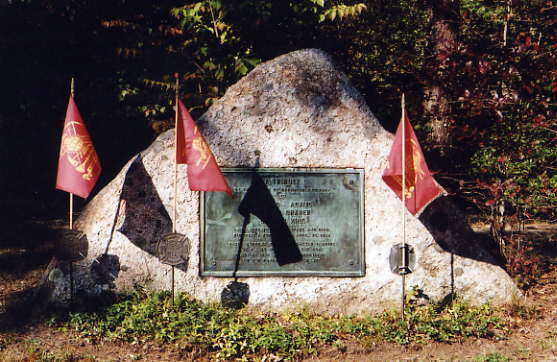 A memorial stands today near the site where they died. concept of the brush breaker was born. A bi-plane can be seen against the plume of smoke at this Cape forest fire. The plane may have been observing conditions from above. 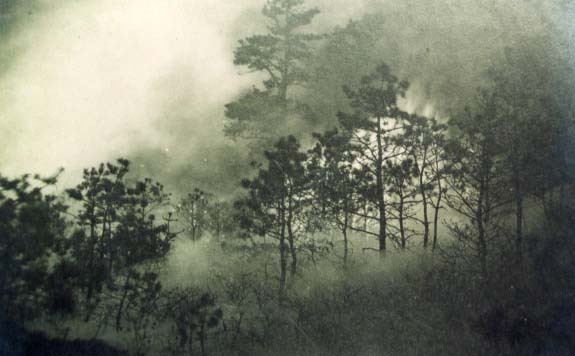 The 1920's brought attention to the forest fire problem at the state level. 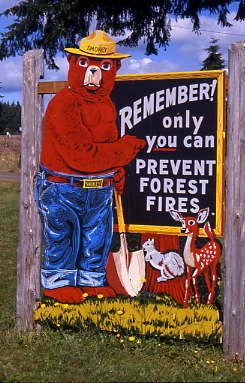 fire roads, and fire prevention measures. 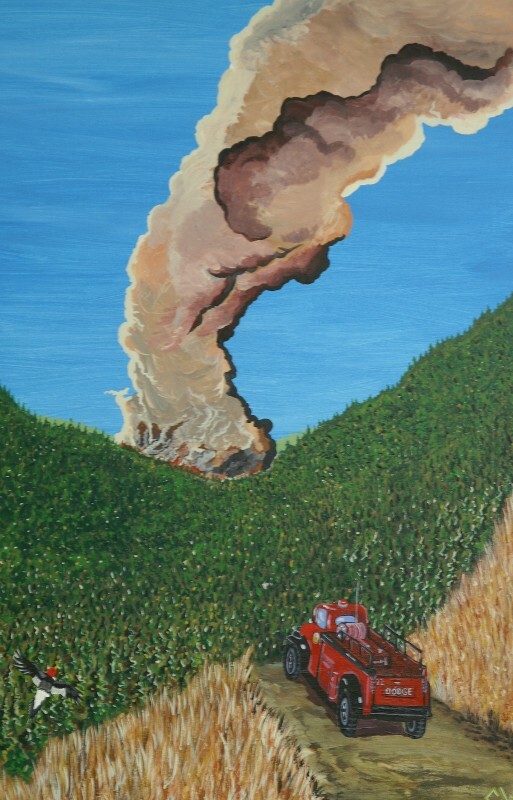 Pine forests in the spring are explosive fuel. Pine trees can explode as a headfire rages through the forest, up hills and across valleys. fuel or go out as weather conditions determine. from one side of the Cape to the other. Fast moving fires were very dangerous. 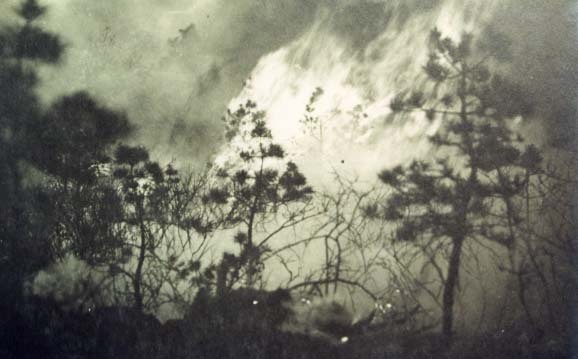 One of the Cape's worst fires ever occurred on April 27, 1938 in the Town of Sandwich. several firemen. 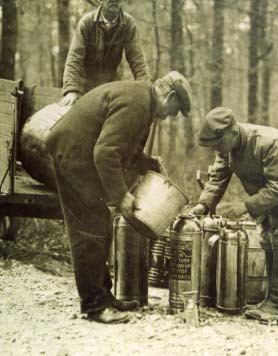 Three men, Thomas Adams, Ervin Draber, and Gordon King died from burns. Help came from several counties. 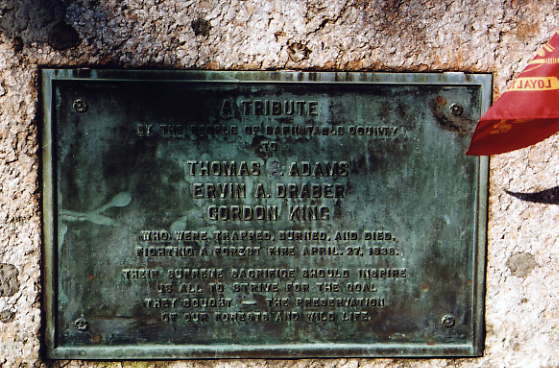 Memorial to Thomas Adams, Ervin A. Draber, and Gordon King. The memorial is locate on Route 130 in Forestdale. 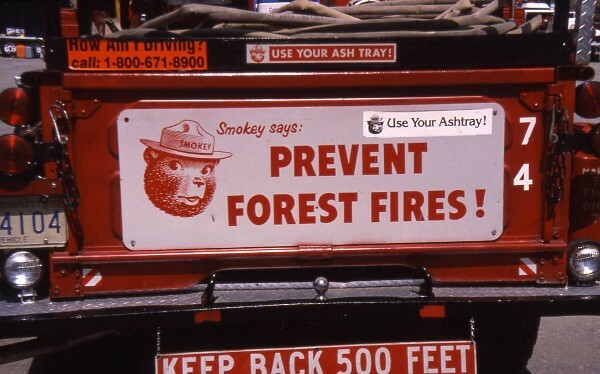 Smokey Bear for fire prevention. 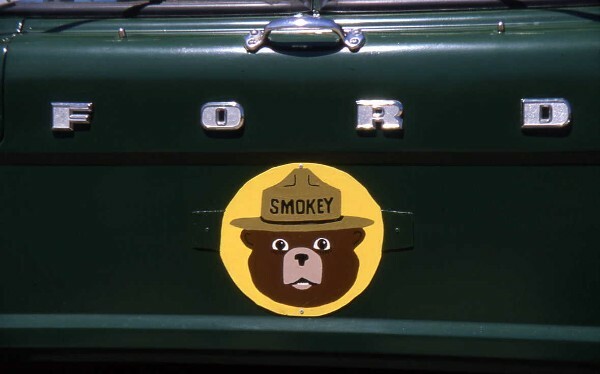 Preventing Forest Fires - Tailgate of DEM District 7 Patrol truck. 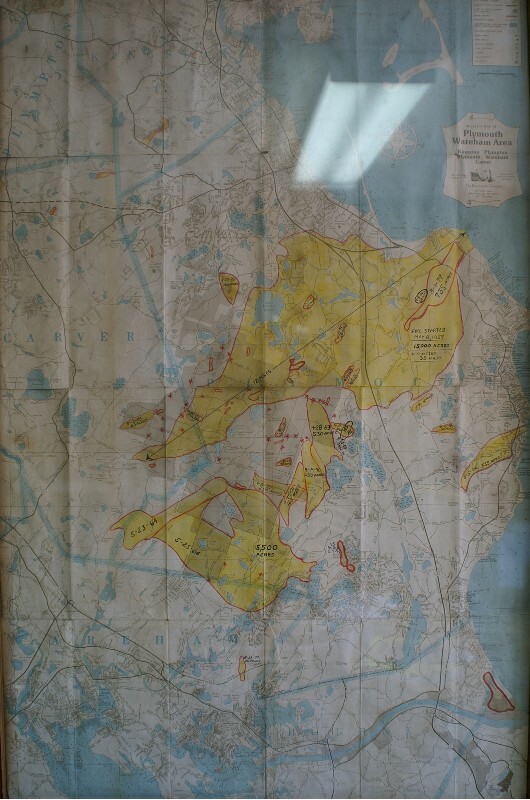 This map is on the wall in the District 2 headquarters at Myles Standish State Forest. It shows some of the major fires that have burned in the Plymouth / Carver area. Some of this information provided by John Hedge, Plymouth FD Captain (Retired) who had researched area news reports about some of the great Plymouth fires. A fire started near Carver and burned to the shores of Cape Cod Bay. Strong gusty winds, the remnants of the great Galveston (Texas) Hurricane fanned the fire as it burned four miles in 30 minutes at one point. The fire destroyed many structures as well. A fire bug was blamed for a large number of fires in Plymouth during the spring and summer of 1937. One fire burned about 300 acres from the Bourne town line to Herring pond. 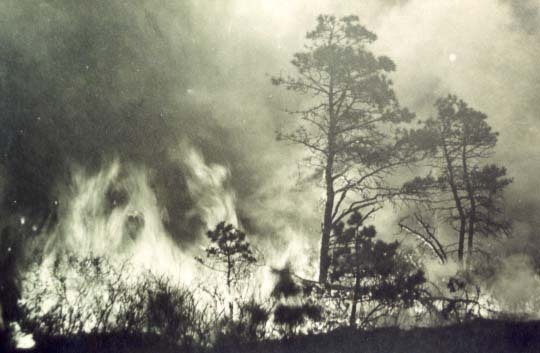 On May 4, 1937 a fire started in the Pine Hills near Mast Road. A sudden change in the wind caused the fire to sweep across Sandwich Road. Two firefighters, James H. Devitt, aged 20 and Herbert R. Benton, aged 38 were trapped on the road and were killed. These are believed to be the first firemen killed in Plymouth. There were many more men on that road at that time who barely escaped, some of whom were badly burned. While that fire was burning another fire began on Island Pond Road, and yet another on Summer Street in Plymouth. With these three large fires burning at the same time, help was called from departments within a 20 mile radius. Over 700 men fought the fires. The following day, another fire began just north of Ponds Road and burned to State Road. These four fires over two days were more than usually experienced in five years. Other fires were set, but controlled with less damage over the next few days. 15,000 Acres burn in a massive forest fire that burned from Cranberry Road in the Myles Standish forest in Carver to the water in Manomet. The fire which began about 3:00 PM on Wednesday had a 3 mile front within an hour. A brisk, strong southwesterly wind drove the fire about 12 miles. About 30 minutes before the fire began, a Plymouth brush breaker had been sent to battle a fire in Mashpee on the Cape. This breaker was recalled to fight the fire in the home town of Plymouth. Apparatus responded to this fire from Framingham to Provincetown according to reports, including apparatus from Falmouth, Harwich, Truro, Onset and Bourne, as well as other Plymouth County departments and all the State apparatus in Southeastern Mass. Soldiers from Otis and prisoners from Plymouth were put to work as were many local and state police officers. Plymouth Fire Chief Everett B. Wood ordered the evacuation of more than 150 people. Approximately 6 cottages were destroyed. Over 3,000 firefighters battled the fire it is estimated. A large fire burned in the South Carver area. The fire tower observed a fire starting up in the Farm-to-Market Road area in South Carver near where the fire burned on the previous Saturday. Just three minutes later, another fire was spotted in the Suther's Marsh Road area off Federal Furnace Road. Eight breakers from Plymouth and Carver responded into the Suther's Marsh Road fire. Other apparatus from Wareham responded into the Myles Standish fire. The Suther's Marsh fire was controlled in two hours, but the other fire continued to gain headway and was now much larger. It moved eastward towards Charge Pond and Camp Cachalot at Five Mile Pond and Little Long Pond. It jumped the Agawam River and moved to White Island Pond. 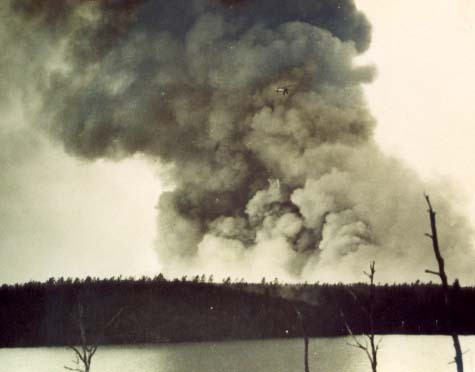 Chief Arthur Lamb chose to take a stand at White Island Pond to block the north end of the fire and at Shangri-La Shores near Glen Charlie Road to the south. 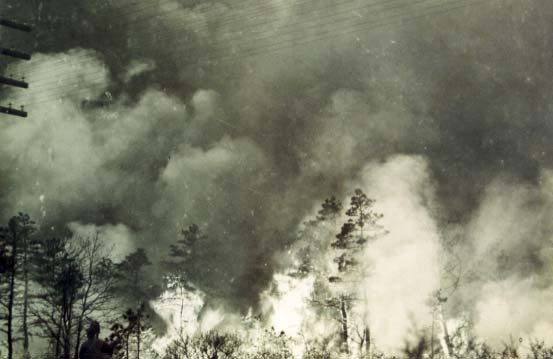 About 1,000 men battled the fire with winds gusting to 30 mph and tinder dry conditions. About 20 cottages lost. About 5,500 acres burned. Seven Plymouth firefighters were burned in a fire that destroyed 165 acres when wind direction changes burned firefighters on two brush breakers. The two damaged vehicles were a 1955 Dodge Power Wagon and a 1968 International. 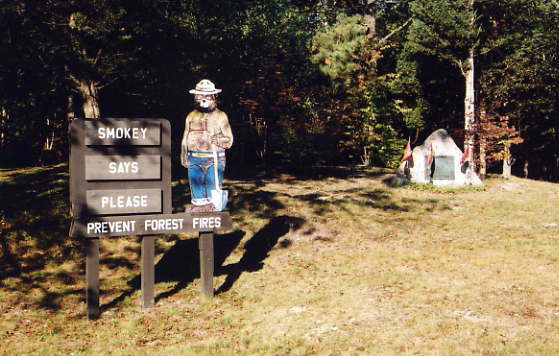 The fire was on the east side of Myles Standish in the Camp Squanto BSA campground. More than 40 apparatus from Plymouth and Barnstable counties fought the fire. About 1,200 acres were burned. A fast moving fire whipped by 25 mph winds forced hundreds of residents to flee a fire in the Captains Country and Wind Shores neighborhoods about 1:30 PM quickly destroying 95 acres and threatening more than a hundred homes in the Bourne Road area. Mutual aid from 18 departments responded. Painting in the Myles Standish headquarters.